These are dry times in California. The Golden State is dealing with a brutal dry spell. 2013 was the lowest rainfall total in the state’s 153-year history. 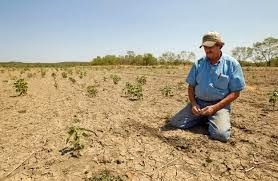 Governor Jerry Brown has announced a drought emergency and is asking California residents to cut their water use by 20 percent. California is a state that likes its water. More than 50% of the state’s residential water use occurs outdoors. A study done a few years ago found that the average home in California uses 192 gallons of water a day. What’s happening in California may not happen to people in other states, but what California is going through can serve as a reminder on how we can save and conserve water when dry times strike. Let’s face it. We want to be able to use water for recreational use. We know water is a necessity but we also want enough water available to keep sprinklers running and keep lawns and yards looking green and healthy. Experts say people in California just need to make small adjustments to their water usage. Things like fixing leaks in household faucets and toilets can help. So can reducing lawn irrigation to only essential times. · Cut down on shower time. Taking a five-minute shower instead of a ten-minute shower can save about 25 gallons of water a day when using a standard shower head. · If you need to clean off a driveway or patio, use a broom instead of a garden hose. · Take a look at any worn washers in faucets. Fixing a faucet that has a steady drip can save around 350 gallons of water a month. · Soak pots and pans instead of letting water run over them while cleaning them. · Even a little thing like turning off the faucet while brushing teeth or shaving can save about ten gallons a day. Let’s take what’s happening in California as a way to look at how we can all do a better job of conserving water. If we do, maybe there will be more to go around.